08 01 09 - 10:50 Some time ago I wrote about a rare sequel to the legendary Afrikan T�hti board game that we scored from an online auction. However, it's not the only game we have bought lately. 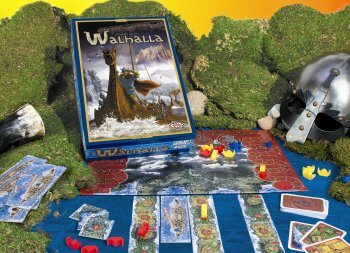 This time I will write about two great Viking board games that we have enjoyed a lot; Walhalla and Fjords. 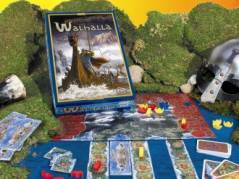 The first one is Walhalla, a game of Viking warriors raiding fjords, fighting, dying, and entering Valhalla. 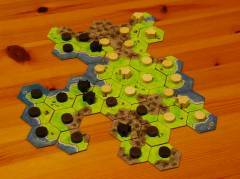 The idea is to take over and hold areas of land in order to score points. However, it's also important to hold a balance between the Vikings deployed on the board, those in reserves waiting to raid some land, and those died valiantly in battle and thus resting in pieces (har har) in Valhalla. The game mechanics are otherwise pretty common, except for the battle; the outcome of a fight is decided by the defender! It is a vital decision, though, as it affects the number of men in Valhalla, which in turn is important for the value of the turn-end reinforcements. Walhalla is a fun 3-4 player game. The only gripe I have with it is its unnecessarily complicated scoring system, which doesn't seem to become intuitive no matter how much I try to memorize it by heart. On our trip to Helsinki last summer we popped in to Lautapelit.fi and in a random stab to darkness grabbed another Viking-themed game Fjords from a shelf. The theme, the low price, and the fact that it was a 2-player game made the decision for us. It turned out to be a lucky buy. Fjords is a light, fast-paced cross between Carcassonne and Go, perfect for spending half an hour with. 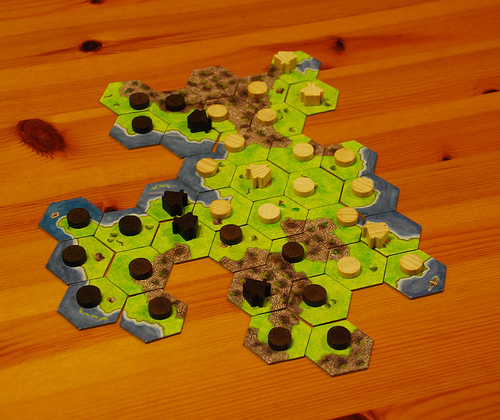 The game has two phases; in the first one the Viking settlers discover the new land tile by tile, setting farms as they go. In the second phase they make fields on the land. The winner is the one who has the biggest number of fields in the end. Surprisingly for a Viking game, it has no fighting of any kind, nor would it benefit from having it. I am truly awed and content with this elegantly composed and well-characterize post. I feel great to peruse this string as an experienced author at buyessys.us and in addition I simply say that The learning idea is astonishing and remarkable yet you can improve it by giving a few references.